Great Saunas is a sauna manufacturer that produces many different types of saunas for American and Canadian customers. The major distinction between Great Saunas and most other sauna manufacturers is that they manufacture and sell their sauna kits directly from the factory. This convenient process allows them to offer some of the lowest prices in the industry. The Great Saunas brand makes twelve different types of saunas, almost all of which are sauna kits that are intended for self construction. One of Great Saunas’ main goals is to provide customers with one of the easiest to build pre-cut saunas on the market. They’ve made a commitment to saving customers money on both construction and products as they provide all of the necessary pieces for customers to build their own sauna and extensive directions to help make the process as easy as possible. Their goal is to create a product that can be assembled in less than two hours by as few people as possible. 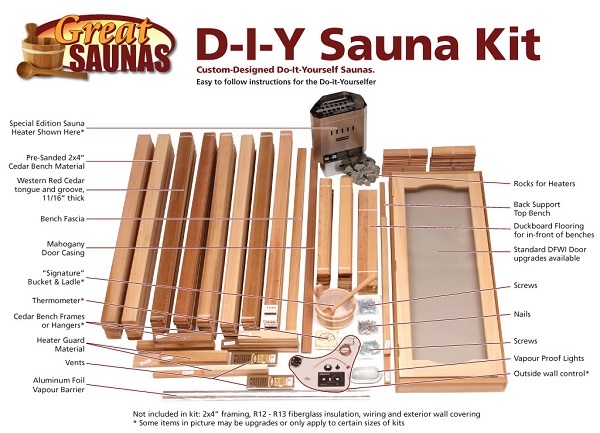 As we’ve mentioned, Great Saunas is dedicated to providing customers with an affordable sauna kit that can quickly and easily be assembled. Customers can choose from an infrared sauna, outdoor sauna, cedar sauna, or Finnish sauna. They have several other options available as well and low priced sauna parts and heaters can also be purchased directly from the Great Saunas factory. With the affordability and easy assembly, very few sauna manufacturers can match the price and convenience offered by Great Saunas. No other manufacturer can provide the quality, low costs, and ease of assembly that the Great Saunas brand can.